SO, once again it’s Steve Irwin Day — an official day of remembrance for the fervent Aussie conservationist who met an untimely watery death in 2006. Last year’s biggest commemorative gesture was the official naming of a newfound Australian snail species ‘Crikey Steveirwini’. 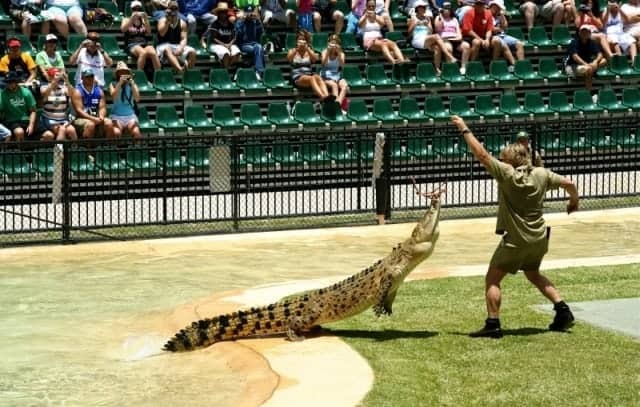 My own personal gesture this year is to write this tribute as I was fortunate enough to meet and interview Steve a couple of years before he died, and last year finally made the pilgrimage to his Australia Zoo in Queensland where wife Terri and daughter Bindi are still at large around the croc enclosures. For anyone who’s been living under a rock for the last decade like silver-tailed scorpions, Steve was the Discovery Channel’s greatest discovery, his Crocodile Hunter show becoming the pinnacle of zoological entertainment watched by half a billion viewers in almost 150 countries. His madcap TV antics will never be forgotten: grappling venom-spitting “super-aggressive” snakes and poking sticks into the nests of “crazy-toxic” spiders, exclaiming terms of endearment like “What a little beauty!”. And of course chasing adult crocs along riverbanks, diving onto them in murky creeks and somehow wrestling them into his little wooden boat. Steve was the bogeyman they warned their baby croclets about. Luckily for them the wildlife warrior finally came a cropper at the hands of a stingray, ironically while filming his latest documentary Ocean’s Deadliest at the Great Barrier Reef. There followed stingray pogroms on Queensland’s beaches where the sea creatures were found dead and mutilated at the hands of moronic vengeful fans. I reported on it all for an Australian mag I was working for at the time, and conducted my interview with Steve at London Zoo. He was exactly how he was in his shows — wide-eyed, over-animated, couldn’t keep still and answered questions as if they were the most pertinent he’d ever heard. KG: What, if anything, are you scared of? SI: Fear’s a natural thing that keeps us alive, mate. Animals don’t frighten me. I’m more afraid of people and the dark cloud of terrorism. SI: Flying certainly makes you aware of your vulnerability, particularly as we film in some fairly remote areas. KG: And getting eaten by a crocodile? SI: I was born into wildlife, mate so I can handle ’em easily! I’m not crazy — just so well-rehearsed that I’ve complete confidence in what I’m doing. Look at electricians — electricity can kill you quicker than a croc, no ifs or buts. One flash and you’re ash! A sparky will take plenty of zaps on his way to becoming fully qualified. Pain teaches you quickly. Once bitten, twice shy — I’ve lived my life by that rule. KG: What was the scariest non-croc moment of your life? SI: Aw, that’d be my wedding day! I’m standing there in a tuxedo with this tight thing around my neck — I’ll tell you what, I’d rather have a boa constrictor coiled around me. That’s the problem with suits — too much stiff in ’em! Gimme some good khakis any day. KG: What has the deadliest venom in the world? SI: The box jellyfish lurks around our northern waters with the most toxic venom known to man. You don’t wanna mess with that little beauty! KG: If given a reincarnational choice, what would you come back as? So, there you have it — Steve Irwin may still be floating around Australian waters to this day, crikey!